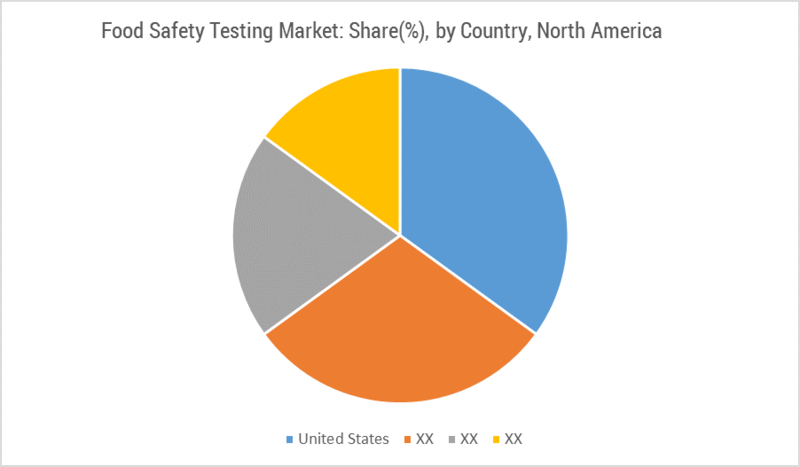 North America dominates the global food safety testing market, owing to its strict regulatory environment and large-scale production. The region is the largest producer of GM soy and corn, which supports the GMO testing market. Increased foodborne illness and increased consumer awareness are primary factors that have driven the market growth. The United States holds the largest share of the North America food safety testing market, followed by Canada and Mexico. The region food safety testing market is projected to reach USD 6.9 billion by 2023, growing at a CAGR of 7.8%. Consumer organizations and other non-profit government organizations are a driving force behind food safety policy. Each of these organizations advocate for food safety in a different way; the focus is on- presenting information through science and research, showing the real-life impacts of foodborne illness on families, and consumer education etc. Food safety testing has to be performed in compliance with the regulations. Different countries have different regulations for import, export and the domestic marketing of food. USDA is the apex regulatory body in the United States. High costs and unclear understanding of regulation associated with food testing is a major restraining factor. Majorly, tests are done by traditional methods, as they are more accurate than the new ones. However, due to lack of time consumers prefer newer technology though it is a costly process. North America food safety testing market segmentation by contamination type includes GMO, pathogens, pesticides, toxins and others. Pathogens hold the major segment of the market due to adverse health effects and immediate retardation of food quality. GMO is the fastest growing segment, owing to the increasing consumer awareness and rising imports of soy, corn, and canola. Food safety testing is applicable for all types of food products. This covers highly perishable, perishable, non-perishable processed and unprocessed foods. By food type, the market segmentation includes dairy, fruits & vegetables, meat & poultry, processed foods and others. Perishable products, such as fruits & vegetables, dairy and meat are prone to microbial contamination and have very short shelf-lives. Food safety testing is highly required for such products. However, processed food has more scope for contaminants such as toxins, residues, pesticides and others. The fruits and vegetables segment is the largest segment in the North American food safety testing market due to the increased pesticides contaminations in this agricultural commodity. However, the processed foods segment is the fastest growing segment, with a CAGR of 7.8%. The United States is the leading market in food products safety and testing; the market in the country is growing at a CAGR of 8.2% during the forecast period (2018 - 2023). Consumer awareness about chemical tests is also rising with recent reports of arsenic in apple juice and acrylamide in processed potatoes and cereals. However, microbial testing dominates the market in the region, followed by chemical tests. Meat and poultry form the largest segment, while processed foods are growing at the fastest rate. Due to the vast natural resources and the relatively small population, the Canadian economy depends on exports, particularly in the agriculture and related food sectors. Canada is known globally for its safe and high quality food products. This is one of the major drivers for the growth of North America food safety testing market. As Mexico is a developing economy, the high cost involved in food safety testing acts as a major restraint to the growth of this market. Major Players: SGS S.A., Bureau Veritas S.A., Intertek Group Plc, Bio-Rad Laboratories, Inc., Eurofins Scientific, Omic Usa Inc., Dupont, Det Norske Veritas As (Dnv Gl) And Mérieux Nutrisciences Corporation. Key strategies adopted by the companies in the food safety testing market are mergers and expansions. 7.11 Lloyd’s Register Quality Assurance Limited.